"My lecturers at Derby College couldn’t have been more supportive. They’ve helped me with my English, maths – in fact with all my subjects." course at Derby College she was so shy that she avoided making eye contact with other people. 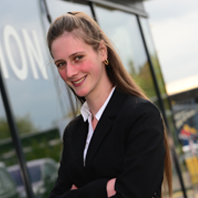 Now, aged 18 and on the Get in 2 Business Level 1, she is a confident communicator – and there is nothing she likes more than talking to other people and trying to help them. Because of her shyness, Monique, who is from Allenton, feared that she might not fit in at College, but once there she found everyone friendly and welcoming. After progressing from Transitions to Get in 2 Business/ICT, she did work experience on Reception at the Roundhouse, the campus where she studies. And, she made such a good impression, that Reception would like her back again this year. While on work experience she dealt with many situations – including welcoming visitors, sorting out their car park passes and assisting people who had forgotten their lanyards. Monique loves helping people – and because she knows how it is to feel self-conscious, she goes out of her way to talk to anyone who is shy. Monique hopes to work for Rolls-Royce or work as an ICT technician when she leaves college, and is so pleased she took the Transitions course. She said: “My lecturers at Derby College couldn’t have been more supportive. They’ve helped me with my English, maths – in fact with all my subjects.